SOME place, floating in Space or perhaps a beach on another planet, or submerged under water: this is what “No Place” feels like. Creator, Adelina Larsson, has drawn on a range of inspirations, from Greek Mythology to the personal experiences and interpretation of the dancers, to develop this work (previewed in 2012 at the QL2 Theatre). It explores an altered state of consciousness, experienced in the period between sleep and wakefulness, sometimes dreaming and sometimes experiencing memories and past struggles through body memory. This time, the Nishi Gallery provided an interesting and effective space, well utilized by set designer Christiane Nowak. Running water over a skylight and window subtly enhanced the mood of the piece. The quiet was intermittently broken by a pebble, skittled across the floor by a dancer’s foot. Concrete walls and floor, a white canvas for the projections, a colour palette of primarily black, white and grey, and minimal lighting, were enhanced by the overcast day and timed with a dusk performance. Light projections created shadows, both from dancer and audience onto the walls, and displayed moving imagery of moons and space-like objects, birds, and sky seen from behind the mouth of a cave. In its concluding minutes, only the theme gave leeway to the lack of lighting. The sound composition and production by Shoeb Ahmad was quite intense and very effective, almost startling. The gallery walls vibrated with the frequency of the bass and held the pulsing effects, creating a sensation similar to being under water. This, along with the choreography and other elements of sound and quiet, created both an overwhelming and relaxing experience simultaneously. The wall of string dividing the space could have been used more effectively by the dancers, who varied their movement to accommodate the audience. Audience members were invited to sit or stand and move around the space and interact as they chose, to experience this immersive production. The dancers maintained minimal interaction with each other’s space and almost none with each other. It was easy to drift away from the dance itself, but the eye was regularly drawn back to Janine Proost. 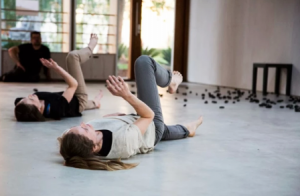 Alison Plevey, Amelia McQueen and Kelly Beneforti made up the quartet whose movements were reminiscent of drifting, floating, falling, moving in slow motion, and building to moments of more frantic, repetitive dance.